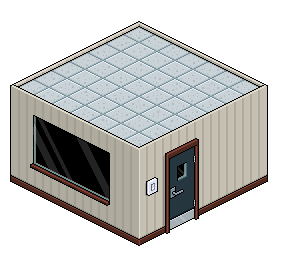 The Army Bootcamp Furni range was released on the 6th May 2015 and was partially released directly to buy from the Catalogue, via Room Bundles and the purchase of Credits and/or Diamonds. The new range featured a new set of furniture including an expansion to the Tents previously released by Habbo. Instead of a standard tent, an 'Office Cubicle' to fit in with the Army Bootcamp theme was released. Along with a new range, the Army Bootcamp campaign gave players the chance to train up and be promoted to their ranks in the army, which featured new badges to earn. Unlike most new lines of furniture, the Army Bootcamp range gave players the opportunity to also buy Limited Edition Rares that corresponded to the army style. With these Limited Edition Rares, it featured an item similar to the Vans and Limos released in other ranges in previous years. The Military Mess Hall Bundle, Habbo Forces HQ Bundle and Military Assault Course Bundle were released in May 2015. The Military Camp Bundle was released in April 2018 as part of the Movie Madness campaign. Using only Builders Club Building Blocks, players were asked to design their Medal of Honour, which is a small symbol of bravery and heroism awarded to soldiers. The top 20 entrants were awarded a Green Hippo each. This competition was a room building contest that asked players to design an underground bunker. The top 20 entrants were awarded a Green Hippo each. For this competition, players were asked to gather a group of 4-6 friends and dress up in matching military clothing. The top 10 groups were awarded a Green Hippo each. This page was last edited on 23 May 2018, at 14:06.